If you’re tired of working for a trucking company and want to try your hand at being your own boss, you can follow in the footsteps of many like-minded people who have made the transition and have not looked back. Being an owner/operator isn’t for the faint of heart. You need to have an entrepreneurial spirit, the discipline to put in the work necessary to build a thriving business and, of course, a big-rig truck. Buying one outright can be cost prohibitive since those massive pieces of machinery aren’t cheap, so leasing is an attractive option worth considering. 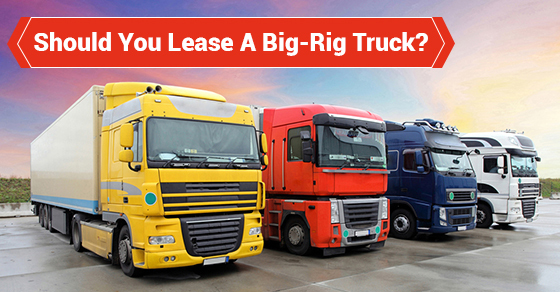 Read on for some information on four signs that you may be ready to lease a big-rig truck – and then comb over information on how to find the best lease options available so that you can realize your dream of getting behind the wheel of you very own truck. Financial Considerations: If you really want to be an owner/operator but lack the finances to buy a truck, then you may be ready to lease a big-rig truck. When you lease a big-rig truck, you can benefit from reasonable down payment arrangements, minimal deposits, no long-term lock-in provisions and more. In other words, insufficient savings or poor credit need not get in the way of leasing a big-rig truck. Pride of Ownership: Yes, you could work for a trucking company and use one of the trucks provided by your employer, but you may be ready to lease a big-rig truck if pride of ownership means something to you. Low Risk: Something you should know is that you can take advantage of what is called a walk-away lease. What this means is that if you lease but somehow figure out soon thereafter that you’re not enjoying yourself, you can unload your lease responsibilities with no fuss and no hassle. So you can enter such a lease knowing that your financial risk is low since you don’t have to stick it out if you opt not to. Go it Alone: You may be ready to lease a big-rig truck if you don’t want to work for someone else. Leasing a truck will allow you to become your own boss and therefore give you the ability to write your own paycheck. At Truck Loan Center, we can set you up with the lease that is right for you. Contact us today for more information on how we can help you get into your new big-rig truck.